There was a time when the church mined the business shelf for wisdom on managing ministries, leadership and growing your church. In some circles, this is still the rage. August Turak appears to be attempting to do the reverse. Business Secrets of the Trappist Monks recounts Turak’s experience of working alongside the monks at the Mepkin monastery. For seventeen years, what he has learned from the brothers’ example, and that has helped him be a better, more successful CEO. Of course, the monks are not Turak’s only source of spiritual insight. He studied Zen Buddhism with some guy in West Virginia and apparently has watched the Devil wears Prada a lot. His association with Mepkin came through a connection he made the Self Knowledge Symposium (a group of college students he leads, where he shares his spiritual insights). He went for a weekend retreat after a student of his had been spending his time volunteering there. That began his long relationship with the monks. So what is it exactly that Turak has learned from the monks? The content of this book is not significantly different from any other business self-help book. Turak attributes the monk’s success to: their commitment to quality, their commitment to community, their selfless service, loyalty, the opportunity their life together makes for personal transformation, integrity and their commitment to a higher purpose. Because Turak is writing for the widest possible audience, his appropriation of the monk’s insights are applied far beyond their particular Christian, monastic commitment. He wants to help business people translate monastic style commitment to their organizations. What makes this book a fun read is Turak’s blend of monastery stories with stories of his own business success and challenges. His spiritual commitments (and personal commitments to running the SKS) has often meant that he has had to forgo opportunities. However these commitments served to pave the way to the particular shape of his success. Hearing his story is part of the fun and of course he makes you wish you knew a bunch of Trappist monks. The Trappist’s Benedictine heritage ensures their commitment to the sacredness of work, as one component of the spiritual life. So it seems natural that Turak can appropriate their insights and experience to the workplace. I enjoyed this book but I am not sure what I will take from it. Secularizing the insights from the monastery means reducing the spiritual insights and religious commitments of the monks into something useful for everyone. There is something good about this, but it is also part of the ‘spiritual but not religious’ lowest-common-denominator impulse. The monks have a vocation. So do business people. They can learn from each other, but their distinctive call is their greatest gift to the world. I think Turak gets this, but when he talks about getting business’s to commit to their organization’s purpose, this will always be a different order of commitment to me than a Trappists commitment to God, community and prayer. The former may be worthwhile, but is temporal. the Godward life connects us to the Transcendent. I would have difficulty committing to my current organization (in the business world) with the same tenacity that monks devote themselves to God. I don’t think I should, even while I agree that commitment to a common purpose will lead to greater corporate success (in general). For the first time in history, there are four generations in the workplace at the same time: Traditionalists (those born before 1945), Baby Boomers (1946-1964), Gen Xers (1965-1980) and Millennials (1981-2001). Each of these generations grew up with experiences that shaped their ideology,practice and assumptions. Traditionalists (or Builders) came back from World War II and built many of the major companies and still lead many of these organizations. Boomers entered the work force and climbed the corporate ladder by putting in long hours. Gen Xers were smaller, and so did not move up the food chain as fast as Boomers did (because Boomers keep not dying). Millennials have now entered the workforce, but are not as inclined to follow the rules as much as the older generations (Gen Xers weren’t either but because of their small numbers, did not effect much change). 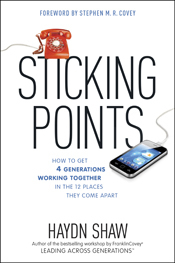 Haydn Shaw has written Sticking Points: How to Get 4 Generations Working Together in the 12 Ploces They Come Apart to help businesses leverage the strengths of each generation. Each of the generations has something to offer. Traditionalists built many of the organizations, industries, and companies. They and Boomers still occupy places of significant leadership, but have not always passed on important information. Gen Xers have navigated the business world (as defined by previous generations) and have risen to meet various challenges. Millennials are poised to creatively contribute to the market but find that they are judged by other generations for their work ethic, lack of experience, and disrespect for authority. Stereotypes about each generation abound, and often the other generations are dismissed for where they are found wanting. Shaw helps us appreciate the gifts of each generation that is rooted in their history. In each of these areas, Shaw helps us acknowledge the tensions, appreciate why the tension is there, identify where organizations can ‘flex‘ to accomodate different approaches, leverage the strengths of each generation and resolve how to handle these areas. I appreciate many of Shaw’s insights and I think this will be a helpful book for people working together from different generations. Because my own vocational goals are ministry, I immediately translate Shaw’s insights to that context. I think he names some of the tensions of intergenerational ministry but his focus is specifically on the work environment (i.e. company policies, work ethic, etc). Some of this is translatable to a church setting (though not all of it). One of the insights of this book that I appreciated was Shaw’s explanation about Gen X as a ‘squished generation.’ When Gen Xers entered the workforce, they did not climb the corporate ladder the way their parents did, nor were they able to effect organizational change because they did not have the numbers Boomers have. As a result, they have learned to navigate working with the older generations, playing by their rules (but breaking rules and asking for forgiveness later). Many of the features of Millennial generation are held in common with Gen Xers but because of their numbers, they will effect greater change in business and industry. However, for the moment Gen Xers are working in dynamic tension between Boomer leaders and Millennial’s entering the business world. They have to navigate both worlds. Books about generations are by necessity generalizations. Shaw admits that his characterizations describe generations but may not describe individual members of each generations. When generational characteristics are used as a hammer, they do not do justice to the personhood of the people they attempt to describe. Thankfully Shaw has put the hammer away and has written a book which helps us appreciate the different assumptions we carry to the workforce and how their can be a greater level of cooperation across generational lines. I give this book 4 stars. Thank you to Tyndale for providing me a copy of this book in exchange for my honest review. While I’m called to vocational ministry, my livelihood for the moment is tied to the marketplace. I work in a retail store and my Sunday morning liturgy this week was sitting through a customer service training. Sitting through my training, my mind wandered to how applicable it was to a church context. Don’t get me wrong, I am not an advocate of the un-examined appropriation of business practices for the church. In business the bottom line is the bottom line. The telos of the church is to be a faithful witness to the coming kingdom (see the difference?). Customer service is especially suspect. When Christians appropriate a customer service model of church we end up ministering to felt needs of congregants instead of dealing with the objective problem (sin). We also fail to remain theocentric in our approach. And yet. . . . As I sat through my training session this morning a thought dawned on me: Some ‘business best practices,’ are inspired by historic Christian witness. Not in a self conscious way, mind you. I doubt that CEOs of Fortune 500 companies read the Desert Fathers (or even the New Testament) to help them form their business plans. However as I sat through a video presentation offering advice on how to exceed customer expectations, I heard dimly the saints of old. This was especially true as the advice I was given for business was taken directly from the hospitality industry. Hospitality is a Christian practice (though not exclusively). The early church took its cue from the Ancient Near East’s value on care for ‘strangers'(cf. Gen. 18 where Abraham offers hospitality to three ‘strangers’) and injunctions in the Torah to care for the vulnerable (Deut. 24:20). So during the early centuries of Christianity, hospitality was not simply entertaining guests in your home for an evening, but a much more robust set of practices aimed at care for those in real need [for a good background on this practice see Christine Pohl’s Making Room: Recovering the Christian Practice of Hospitality (Eerdmans 1999)]. Early Christians rescued infant girls left to die of exposure and cared for the sick in their communities. Travelers in the ancient world were particularly vulnerable, and Christians offered a safe haven. As the church’s resources grew (as well as the need), the Christian practice of hospitality became formalized in the establishment of hospitals as well monasteries and inns which cared for travelers. This was the precursor to the modern hospitality industry. When businesses seek to cultivate longstanding relationships with clients and offer service that goes above an beyond their expectations, they often look toward the hospitality industry(i.e. the Four Seasons Hotel, Walt Disney Resorts, etc.). And perhaps the cycle continues. But there are problems with this scheme. The historic practice of Christian hospitality was meatier and more robust than its modern capitalist equivalent. When hospitality got institutionalized (into hospitals and hotels), it allowed for care of greater numbers of people, but something of the quality and attention of the earlier practice was lost. So when churches attempt to learn from business on how to minister to the felt needs of their congregants, they are appropriating a watered down version of their own practice. The personalized care of the early church is lost. So is the depths of their biblical and theological reflection. Does this mean that the church can’t learn from exceptional customer service representatives. Nope, all truth is God’s truth and some of God’s truth is wrapped up in contemporary business practices. 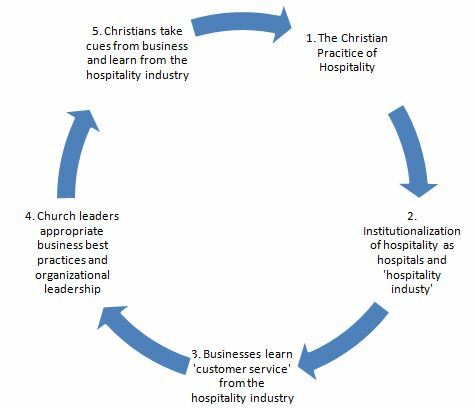 I would be wary of how ‘customer service’ models would turn congregants into consumers, but to the extent that ‘customer service’ is a recovery of the practice of hospitality, we certainly can learn from the best practices of businesses. In the retail business, caring for the customer and exceeding their expectations ensures their loyalty and strengthens your business relationship with them. In the church, hospitality makes visible the love of God before a watching world and brings needed care to the vulnerable members of society. When we learn hospitality solely from business leaders our vision of hospitality is too small. 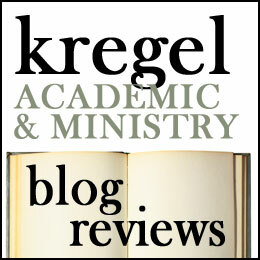 Recovering a Christian practice involves learning from notable examples in church history (i.e. the early church, the Desert Fathers and Mothers, St. Benedict, Basil the Great, Francis of Assisi, the Pietists, The Catholic Worker Movement, etc.). 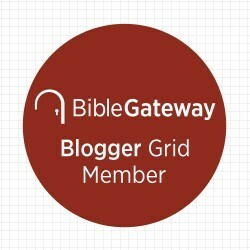 It also means reading the Bible evocatively, allowing it to shape our imagination of how we in the church can best express the the hospitality of God. And it involves learning from exceptional practitioners (Christian or otherwise) about how to care for the vulnerable among us. What is the greatest customer service experience you have ever had? Does the church offer something different from that?